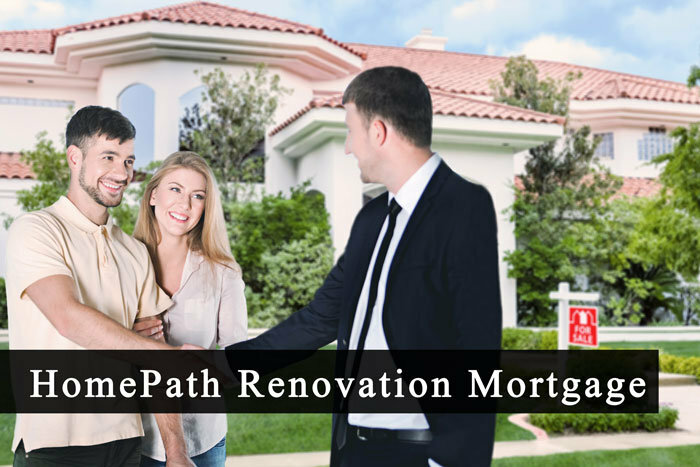 What Is HomePath Renovation Mortgage? The HomePath Renovation Mortgage was extremely popular at one time. This is where a home buyer can purchase a HomePath property which are properties that are owned by Fannie Mae. HomePath homes are homes that have been foreclosed upon and is now in the ownership of Fannie Mae and the property buyer is purchasing the property from the inventory of foreclosures Fannie Mae has. Fannie Mae used to offer the HomePath Renovation Financing program which was a Conventional Loan program where the home buyer can qualify for the acquisition of the property plus the loan program for construction costs of the property. It was similar to a FHA 203k Loan where the home buyer could purchase a home with a very small down payment and the lender will finance both the acquisition and construction costs of in one loan. However, HomePath Loans had higher credit and debt to income ratio standards and requirements than FHA 203k Rehab Loans. Not all mortgage lenders participated in the HomePath Renovation Financing program. To qualify for the HomePath Renovation Mortgage, the home buyer needed to purchase a HomePath Property which was a list of foreclosed home that was owned by Fannie Mae. Unfortunately, both HomePath Renovation Morgage and HomePath Loans are no longer in existence and has been discontinued since October of 2014. Both HomePath Loans and the HomePath Renovation Financing is no longer available since October 2014. HomePath Loans were conventional mortgages offered by Fannie Mae where for as little as 3% down payment, a home buyer could purchase a Fannie Mae owned foreclosed property with no private mortgage insurance required. Fannie Mae HomePath Loans also had the financing which was not just the acquisition of the property but also for the construction of the project all rolled into one loan. Both the regulator HomePath Loans and HomePath Renovation Mortgage Financing were only offer to home buyers who qualified for a Conventional Loan plus met the guidelines of the HomePath Loans financing program. Again, HomePath Loans and HomePath Renovation Mortgage Financing were discontinued back in October 2014, however, Fannie Mae HomePath properties are still around. There are also alternatives to HomePath Renovation Mortgage Financing via FHA 203k Rehab Loans where a home buyer can purchase a fixer upper that may need total gut rehab or in need of a room addition with 3.5% down payment and no closing costs. Fannie Mae never required to use Fannie Mae HomePath Loans for Fannie Mae HomePath home buyers. Home buyers can still purchase a HomePath home, which are properties owned by Fannie Mae, with other mortgage loan programs such as a FHA Loan, VA Loan, or standard conventional loans. Fannie Mae also permitted and still permits to purchase a Fannie Mae HomePath home with cash. Fannie Mae has still the HomePath Property Program available but no longer offer the HomePath Loan Program. Fannie Mae HomePath Properties are properties that are owned by Fannie Mae where Fannie needs to sell at the best possible value. One of the issues with any properties that have been foreclosed on is that it may not be in the greatest shape. All Fannie Mae HomePath Properties are homes that either have been foreclosed by Fannie Mae or properties with Fannie Mae mortgage borrowers that have been voluntarily surrendered by the homeowner to Fannie Mae either via deed in lieu of foreclosure , abandonment, or short sale. Fannie Mae is the seller of these properties and many times Fannie Mae will just sell the properties as is. Home buyers tend to like buying Fannie Mae properties because they think they are getting a deal when buying a fixer upper, foreclosed property, or short sold home. This is often not the case. Fannie Mae has a reputation of not budging with price negotiations and taking their sweet time when it comes to responding with offers from home buyers. On another note is that home buyers buying foreclosed properties often do not realize that REOs tend to need a lot of work. Both Fannie Mae standard HomePath Loans and HomePath Renovation Mortgage Financing no longer exists. However, home buyers can still purchase fixer uppers as well as foreclosed homes that is Fannie Mae owned and get acquisition and construction financing without the availability of the HomePath Renovation Mortgage Loan Program by going with the more popular FHA 203k Rehab Mortgage Loan. Fannie Mae HomePath Renovation Mortgage Financing Versus HUD FHA 203k Rehab Mortgage Loan Programs: Conventional Loan Program that covered the acquisition and construction costs of a Fannie Mae owned property. Owner occupied, second homes, and investment properties are eligible. FHA 203k Rehab Loans are HUD approved acquisition and construction loan program all in one loan for owner occupied properties. Down Payment Requirements With Fannie Mae HomePath Renovation Mortgage Financing Versus FHA 203k Rehab Loans: Fannie Mae required 3% down payment of the after completed value of the subject property on all acquisition and construction Fannie Mae HomePath Renovation Mortgage Programs until this program ended. FHA requires 3.5% down payment on the after improved value on all FHA Loan Programs, both FHA 203k Rehab Streamline and Standard FHA 203k Full Rehab Mortgage Program. Types Of Financing Fannie Mae Allows Versus FHA: Again, the Fannie Mae HomePath Renovation Mortgage Financing program is no longer available for quite some time, when it was effective, Fannie Mae allowed owner occupant properties, second home financing, and investment home financing. This was one major advantage of Fannie Mae HomePath Renovation Mortgage Financing Program versus FHA 203k Rehab Mortgage Program where with FHA, only occupant properties are eligible. Types Of Properties Eligible: Both Fannie Mae and FHA mortgage loans are limited to residential properties that are one to four units. There was no mortgage insurance required with Fannie Mae HomePath Renovation Mortgage Financing. Need to meet all Fannie Mae Lending Guidelines with regards to credit scores and debt to income ratios. To qualify for a FHA 203k Rehab Loan, borrowers need to meet all FHA Guidelines with regards to credit, credit scores, and debt to income ratios. FHA 203k Rehab Loans does require all of the FHA mortgage insurance premium requirements as with standard FHA Loans where 1.75% upfront FHA mortgage insurance plus a 0.85$ annual mortgage insurance premium is required. Fannie Mae allows for owner occupant, second homes, and investment financing whereas, FHA, only requires owner occupant financing. FHA 203k Rehab Mortgage Loans : FHA Mortgage Loan Program that covered the acquisition and construction costs of any owner occupied one to four unit property with 3.5% down payment of the after completed value of the subject property for owner occupant properties only. Second homes and investment properties do not qualify under the FHA 203k Rehab Loan Program. There is upfront and annual FHA mortgage insurance premium required. Need to meet all HUD 4000.1 FHA Handbook Guidelines. Fannie Mae Home Path Loans are Conventional Loans offered by Fannie Mae to purchase Fannie Mae owned properties. Although Fannie Mae HomePath Loans has been discontinued, Fannie Mae still has Fannie Mae owned properties which is available to the public as long as the home buyers can secure their own financing. You can buy a Fannie Mae owned property with any type of loan program as well as cash. Why does Fannie Mae own properties? The role of Fannie Mae is to set rules and regulations on three types of loan programs. Owner Occupied Primary Residence Home Loans: A home buyer can only purchase owner occupied homes with FHA Loans. Second home financing and investment home financing is not allowed with FHA Loans. Owner occupied properties are where the property buyer is attesting to the fact that he or she will be occupying the property they are buying. Down Payment Requirements Of Fannie Mae Versus FHA : Minimum down payment requirements for owner occupant properties that are one unit dwellings are 3% down payment for first time home buyers and 5% down payment for seasoned home buyers for Conventional Loans. Two to four unit properties that are owner occupant properties require 15% down payment or more for Conventional Loans. FHA requires a 3.5% down payment on a home purchase for owner occupant properties. Second Home Financing: Second home buyers can only qualify for second home financing with a Conventional Loan either via Fannie Mae and/or Freddie Mac. Government loans such as FHA, VA, and USDA are for owner occupant property financing only. Second home buyers can qualify for second home financing with a Fannie Mae Conventional Loan with 10% down payment and needs to meet all Fannie Mae Lending Guidelines with regards to credit and debt to income ratios.Fannie Mae has specific guidelines on what classifies as second home financing. Fannie Mae Second Home Requirements : A property home buyer cannot qualify for second home financing if they own a primary home that is equivalent in price and size as their second home purchase and is in close proximity as their primary home. A second home to qualify for second home financing needs to be at least 100 or more miles from the second home buyer’s primary residence or if it is closer than that, the second home either needs to be a waterfront property or in a resort area. You cannot qualify for second home financing if the second home purchase is down the block from your primary home and the value and square footage is the same as your primary home. Investment Property Loans: Investment property types needs to be one to four unit residential units and cannot be mixed used properties where one or more of the four units are zoned commercial like store fronts. Minimum down payment requirement for Conventional Loans on investment property financing is 15% or higher. 15% down payment on a single family home and/or one unit investment property and more than 20% down payment on multi unit properties, with the maximum housing unit cap being 4 units. Other Investment Property Requirements: Besides the down payment requirement, investment property borrowers need to meet all other Fannie Mae mortgage lending guidelines such as minimum credit score requirements, credit requirements, and reserve requirements as well as the lender overlays on the particular mortgage lender who they choose. Fannie Mae will only allow up to four financed properties to be eligible for cash out refinancing loans. If a property owner has five to ten financed properties , Fannie Mae will require the borrower to have a minimum of a 720 FICO credit score and can only do a rate and term refinance. Most foreclosure properties require work and all of Fannie Mae owned homes are inventory of foreclosed homes that Fannie Mae owns. The most common and popular acquisition and construction loan program where a home buyer can easily qualify for is a FHA 203K Rehab Loan. With a FHA 203k Mortgage Loan, the home buyer can purchase either a fixer upper or a Fannie Mae HomePath property that needs works and can get both the acquisition and construction rehab funds all in one loan with only 3.5% down payment of the after improved value of the property. With a FHA 203k Rehab Mortgage Loan, there is no limit on how much you can budget for your renovation costs as long as it appraises out and the FHA borrower does not go beyond the maximum FHA Loan Limits of the county where they are purchasing their property. FHA 203k Rehab Loan Specialists and can help any home buyer who is interested in buying a fixer upper and/or Fannie Mae HomePath Property with a 3.5% down payment of the after improved value of the property. If you have any questions in qualifying for a FHA 203k Loan, please contact Gustan Cho NMLS 873293 at 262-716-8151 or email Gustan Cho at gcho@gustancho.com.